↑ Matthew 2:11. 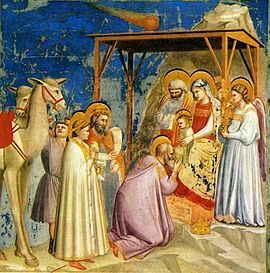 When the magi arrive, Jesus is a "child" (paidon) in a house, no longer an infant (brephos) in a manger, as when the shepherds arrive in Luke. (Patterson, Dorothy Kelly, Women's Evangelical Commentary: New Testament, p. 20) As he is with his mother, the forty day confinement period prescribed by Jewish law has already passed.